* Large cloud of airy violet – slightly sweet, but not candied. * When I say cloud, I mean it’s airy and voluminous – like you walked into a hazy space and you feel the violet all around you. * Actually, fumée means smoke in French – so the smoke / cloud effect makes sense. * After the first hour, the cloud begins to get closer and a little more dense. * It gets a little more masculine, with lavender and sage cutting the sweetness a bit. Violet is still the focus – these are just there for support. * The scent also reacts differently on my skin. Sometimes I get a musky floral after the lavender, while at other times there is a dry rose. * In the deep dry-down, the violet is still the star with some resins grounding it. Summary: Mona Di Orio is a line that I have been meaning to explore for a while. Many fragrance friends of mine are diehard fans, and even though I have a sample kit, I haven’t dove in. A trip to a Louisville perfumery netted me this sample of Violet Fumee, and I can see why people love the line. This is not a feminine, candy sweet violet bomb. Neither is it a classic masculine violet lavender. The feeling is defiantly unisex, mixing both sides together for a composition that can develop on your skin in a few different ways. After the first hour, this would be a great office scent because while it’s long-lasting, it’s not so strong as to overpower those around you, yet you will definitely smell it on yourself for at least 8 hours. The price is on the high side, so definitely test it a few times before you take the plunge. And yes, this has inspired me to dive into my sample box. 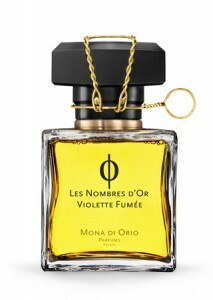 Mona Di Orio fragrances are available from Lady Ruth Perfumes, LuckyScent and MIN New York. Disclaimer: Sample provided by Lady Ruth Perfumes. Picture courtesy of LuckyScent.